A Long Island native, Dr. Dory Stutman earned his dental degree from the School of Graduate Dentistry at Case Western Reserve University. He completed his general practice residency at MetroHealth Medical Center in Cleveland, OH and a postgraduate program in esthetic dentistry at the University of Buffalo. Dr. Stutman has been in private practice since 1991 and opened the doors of South Shore Dental Care in 1995. He attends more than 100 hours of advanced dentistry seminars each year, concentrating on cosmetic dentistry, dental implants, and full-mouth reconstruction to repair broken down smiles. He has trained under some of the finest and most well-known dentists in the United States. He is also a clinical consultant for The Dental Advisor, a publication for which he evaluates dental products. His article, entitled “Bonding on Tetracycline Teeth,” appeared in the October 2003 issue of Dental Town magazine. Dr. Stutman is a member of several professional organizations, including the American Dental Association. 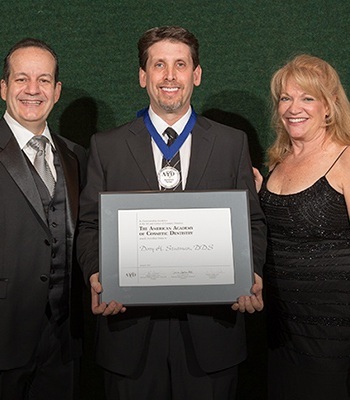 He is also an accredited member of the American Academy of Cosmetic Dentistry (AACD). His interest in art and sculpture is evident in the magnificent smiles he creates for patients. He also enjoys travel, Broadway shows, movies, music, dining, sports, and spending time with his family.